Coffee is one flavour that never fails to shake awake our senses, however tired we are! Here are some cold as well as hot coffee-based beverages. 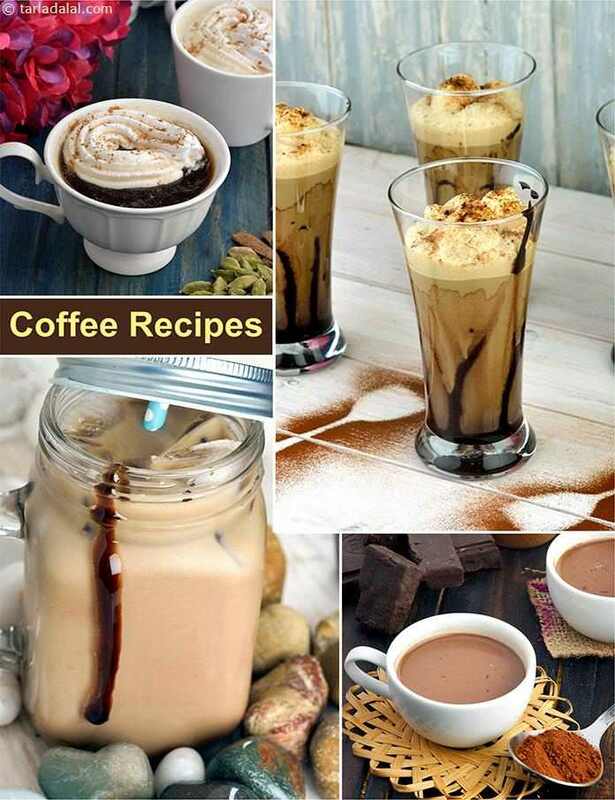 Reboot your day with recipes like the Coffee Frappe , Cold Coffee Recipe and Orange Coffee. For coffee lovers anything with coffee flavour is a hit. They try to mix and innovate with coffee. So this section find some more coffee flavoured beverages to please your taste buds. Indulge in this rich and refreshing coffee-flavoured milk shake to shake off your tiredness on a busy day. The coffee frappe can be made quickly anytime you feel game for it, if you have a box of vanilla ice cream ready on hand. Orange zest and a dash of whisky adds a new dimension to the regular hot coffee. Whether planning a quiet affair or a lavish celebration, the warm coffee laced with whisky and topped with sweetened whipped cream will certainly make your guests feel special. A tantalizing treat for adults, Affogato features a rich coffee-brandy cocktail served atop creamy Vanilla ice-cream. Laced with cinnamon powder, this heart-warming beverage sets the perfect mood for a long chat with a loved one. Did we say banoffee smoothie? as you might have smartly guessed, the name comes from a combination of bananas and coffee. The success of this smoothie lies in getting the decoction right. So, follow the method exactly as mentioned, and forget yourself in this heavenly drink. Quick and lip smacking smoothie! A coffee and chocolate flavoured smoothie. This will be loved by children as well as adults. Enjoy this cold-cold on a hot sunny day. A cool drink loved by all and helps beat summer! Caramelized sugar gives nice flavour to this mocha frappe. A chilled frappe spiced with cardamon. Chocolate means love. So i felt it was only right to give everyone's favourite cupp...a twist with it. So here is presenting coffee chocolate tea. A smoothie with coffee and Banana goodness.